LC: Garnet – Brown. BG: Pale, Garnet rim. AKG: Cherry, garnet, glossy. EU: Garnet. LC: Thin hot and acidic – medium finish but little or no fruit. Bramble with perhaps a hint of strawberries. BG: Good acidity, charcoal, cherry, simple, slightly hot, slightly rough. AKG: Nice mouth feel, a bit hot, fairly well balanced. Medium long finish. Cranberry strawberry charcoal. EU: Cherry, juice, relatively short light flavor, peppery finish. Light tannins. In 2013 the Bench 1775 winery succeeded another winery on the same property that was named Soaring Eagle. The beautiful lakefront Naramata bench property including the 7.5 hectare vineyards, were thoroughly renovated when the vineyard was purchased. The winemaker and manager here is Val Tate. 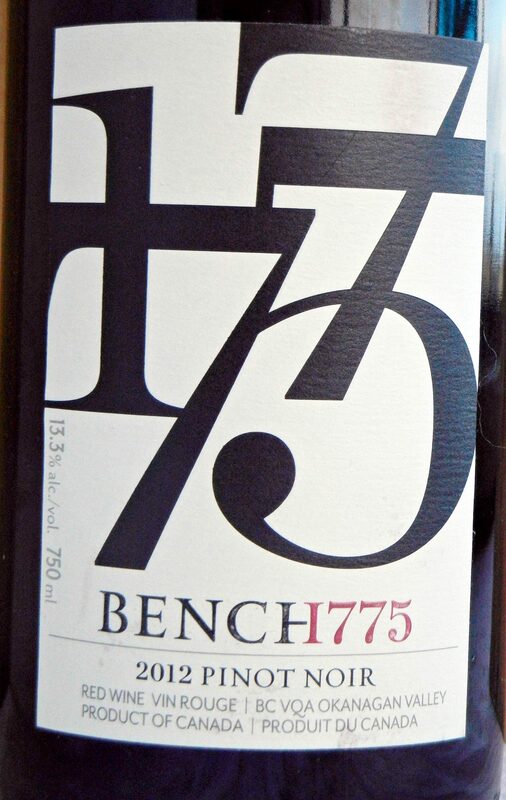 The Bench 1775 pinot noir comes exclusively from the estate vineyard situated at about 440 M, that was planted in 2006. Annual case production is about 400 cases. The wine spends less than a year in French oak. 2012 was the inaugural vintage. LC: Almost purple to rim. BG: Cherry rim, pale, attractive looking. AKG: Cherry – purple. EU: Red, bluish edge. LC: Cherry, hints of vanilla. BG: Cranberry, pomegranate. Soft ripe fruit. AKG: Mint, blueberry, licorice. EU: Rose, floral, candied strawberry or cherry, perfumed soap? Vanilla. LC: Hint of chocolate, sour cherry, white pepper, vanilla, thin body, medium finish, wants food. Tannins well-controlled. BG: As on nose, very juicy cranberry/pomegranate acidity. Good intensity with medium length. Easy, pleasant, clean, fairly focused fruit. AKG: Sour cherry, licorice, forest floor, a bit thin. EU: Vanilla cherry, strawberry candies, light tannins, balanced acidity, finish of strawberry and cranberry. The Summerland area of the Okanagan GI lies on the West side of Okanagan lake just North of Penticton and directly across Okanagan Lake from the town of Naramata. The area is a cluster of hills surrounded by gently sloping flatland and dominated by the 850 M tall shattered volcano remnant called Giant Head . The thirteen wineries that make pinot noir in this area are located both North and South of Summerland itself. 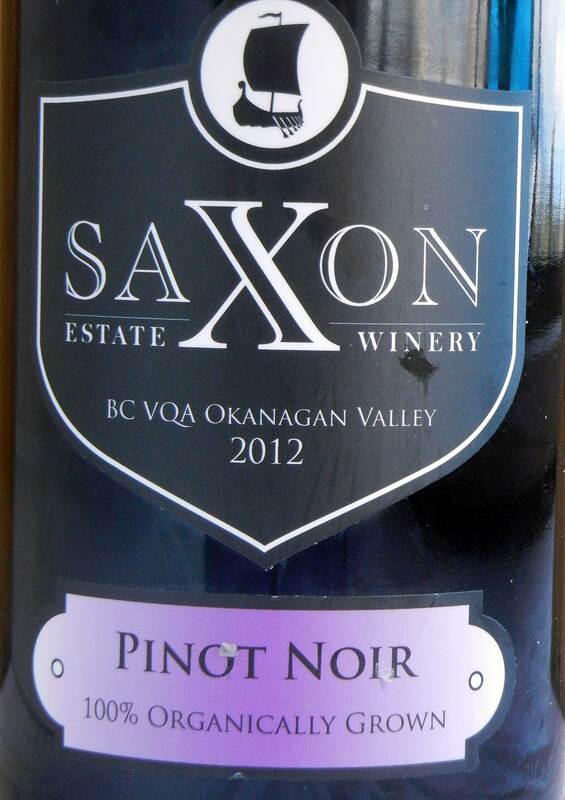 Saxon Estate Winery resides in the Southern group and is the most Westerly of the pinot noir wineries here. It sits in the Western shadow of a 650 M hill adjacent to Giant Head. Saxon Estate Winery was created when Paul and Jayne Graydon purchased the assets of the winery known as Hollywood and Wine. The wine is 100% organic and all estate. The clones are 114 and 115. The winemaker for this vintage was Danny Hattingh. Tom Di Bello took over as winemaker in 2015. 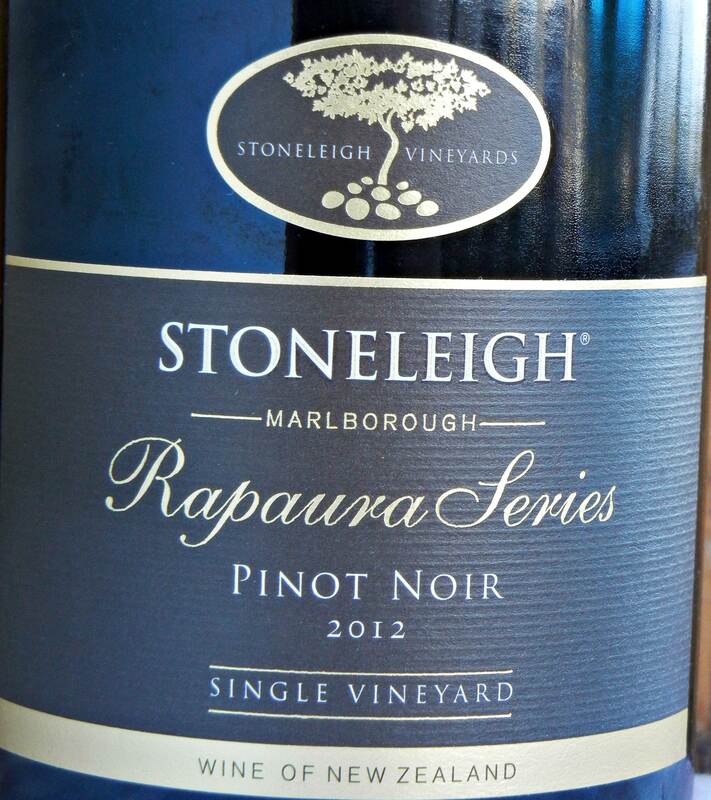 This is the inaugural vintage of pinot noir under the Saxon name. LC: Ruby,denser color than previous two wines – almost purple to rim. BG: Pale, cherry/slightly purple rim. AKG: Purple. EU: Magenta. LC: Dark cherry/blueberry. Vanilla, hints of warm spice, cranberry. BG: Tar than cherry. Decent intensity, peppery, not that pinot-like. AKG: Blackberry, roses, baking spices. EU: Light cherry, dried fruit, beets. LC: Flavor similar to the nose – tart almost sour. Medium long finish, some bitterness at end, not well-balanced a bit alcoholic. Not particularly pinot-like. BG: Fairly closed with some tannic grip still. Slightly more concentrated California style fruit. Just not familiar Pinot character. Simple, with acidity medium plus. Alcohol and resident tannins masking complexity of ripe fruit that is underneath. AKG: A bit acidic, but interesting flavors, savoury fruits, nice ending but a touch bitter. EU: Simple light flavors, strawberry, dried cherry. Distinct tannins which last for 30 seconds or so, peppery finish, not well-balanced. Tantalus Vineyards was established in 2004 by investment dealer Eric Savics when he purchased the previous winery called Pinot Reach Cellars. The property had a lot of history as some of the grapevine plantings went back to 1927. The pinot noir vines on the property include some clone 93 (a Spatburgunder or German clone) planted around 1985 and Dijon clones including 667, 115 and 828 were added between 2005 and 2012. 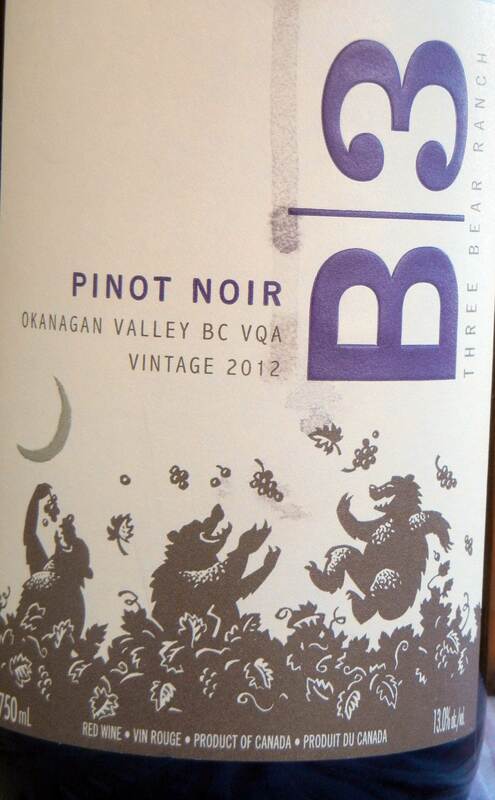 The first pinot noir release was in 2006. This wine is made entirely from the clone 93 vines. The story of pinot noir at Tantalus has to some degree followed the transition from the German clone to Dijon clones. That journey has seen the production of this separate Clone 93 bottling as well as a “Juveniles” bottling that utilizes the younger Dijon vines. Those wines were a great opportunity to taste the separate elements of clone and vine age. The gently undulating vineyards mostly face West towards Lake Okanagan some two kilometers away at a height of about 400 M and are just South of Kelowna near three other pinot noir producing wineries – Sperling, Spearhead and Nagging Doubt. 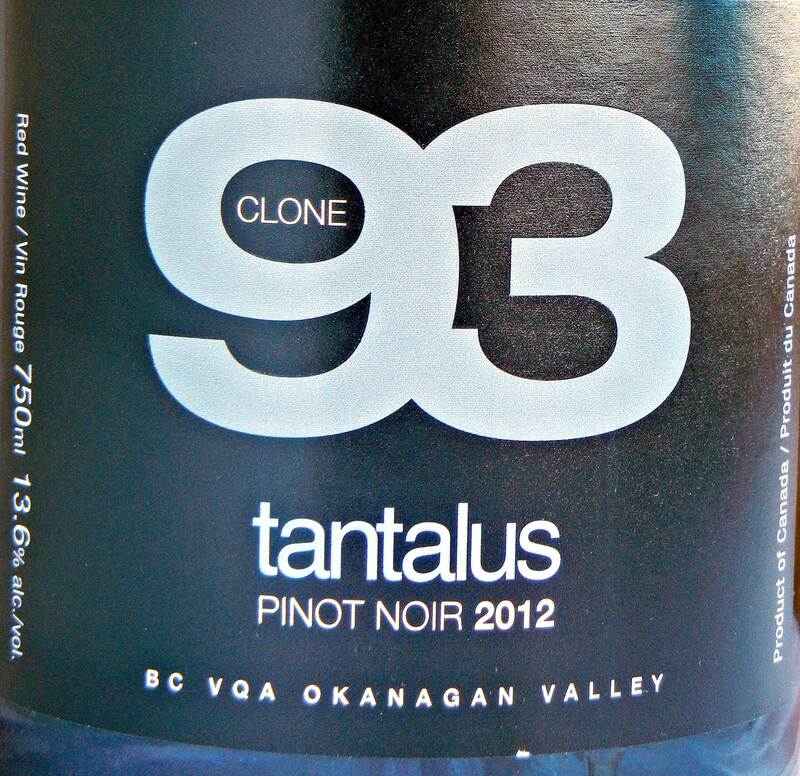 Tantalus is fortunate in having had the same winemaker since 2009, the Vancouver born New Zealander David Paterson. His winemaking experience included time at the renowned Henschke Cellars in Australia. LC: Garnet. BG: Quite pale light cherry rim. AKG: Garnet. EU: Light ruby. LC: Very inviting, fairly complex nose. Strawberry, floral notes, slight vanilla, hint of cinnamon. BG: Strawberries/cherries/vanilla. Sweet pie spices. Very appealing rose petal. AKG: Barnyard, kerosene, huckleberry. EU: Rose, smoke, charcoal, pomegranate, strawberry. LC: Quite acidic but not overly hot. Some spiciness, acid seems to overpower the fruit – cranberry, strawberry, white pepper. Longish finish fairly well balanced. BG: Focused fruit, pomegranate, excellent balance, layered. Strawberry/cherry/vanilla, bit of good barnyard, forest floor. Plush texture. AKG: Cherry, toasted oak, slight bitterness. EU: Sweet spice cherry, vanilla, medium long finish, rose, lots of glycerol, light acidity, slight white pepper, residual sugar? The Artisan Wine Company is affiliated with the Mission Hill Family Estate winery and its wines are produced from the same facility. The grapes are sourced from vineyards throughout the Okanagan Valley. The value here is impressive. LC: Red to garnet. BG: Pale with a slightly purple rim. AKG: Cherry – garnet. EU: Red. LC: Warm spices, a bit hot, cherry. BG: Raspberry/fresh plum forward, grapey, slightly candied and a little suspicious on the nose. AKG: Dusty, earthy, peppery, cherry. EU: Vinous, strawberry jam, like compost. LC: Sweet cherry. Quite simple, medium finish. Slightly hot, grapey. BG: Pomegranate molasses, minerality, dirt, appley, acid/grippy, short, simple. AKG: Peppery, savoury, big flavor, savoury fruits. EU: High alcohol, glycerol, like cherry jam, grape juice, unbalanced acidity and alcohol, light tannins. This 2012 Winemaker’s pinot noir was harvested from four different blocks in the Oliver vineyard. The grapes were fermented in stainless steel tanks before being transferred to French oak barrels for 10 months aging prior to blending and bottling. LC: Garnet rim. BG: Quite pale with a light ruby rim. AKG: Garnet. EU: Bright ruby. LC: Pomegranate, warm spices, mushroom. BG: Peat, stewed plum, tar. Some boldness. Good harmony and balance on the nose. AKG: Toasted marshmallows, floral, red fruits. EU: Cherry, watermelon, jasmine, dried strawberry. LC: Warm, cranberry, pomegranate, gravelly, fairly big spicy finish. Quite long finish. BG: As on the nose, peat, tar, plum, cherry, alcohol medium plus, cherry in finish. Good balance, Bolder fruit then average, finish medium plus. AKG: Peppery, cherry, raisin. EU: Strawberry, cherry, good acidity, high alcohol. Unbalanced alcohol but soft. 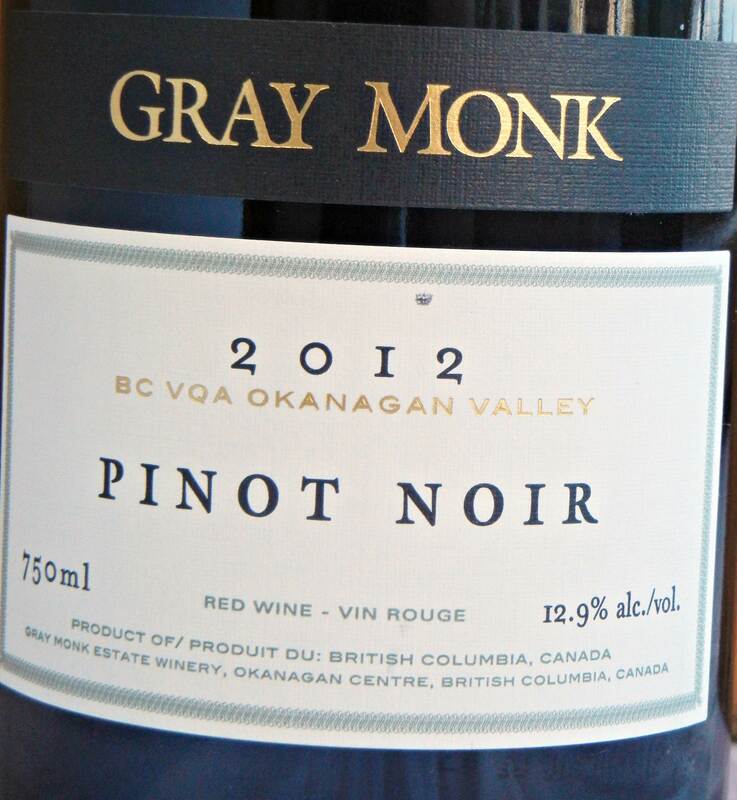 Gray Monk is one of the five original estate wineries that pioneered the modern B.C. wine industry and is also one of the very few wineries in the country where four generations of the family have been involved. The winery opened in 1982 near Okanagan Centre, a neighbourhood and formal ward within Lake Country, on the East shore of Okanagan Lake, just North of Kelowna above the 50th parallel. Originally, Gray Monk focused exclusively on white grape varieties but in the early 2000s they added red grape varieties to the mix. 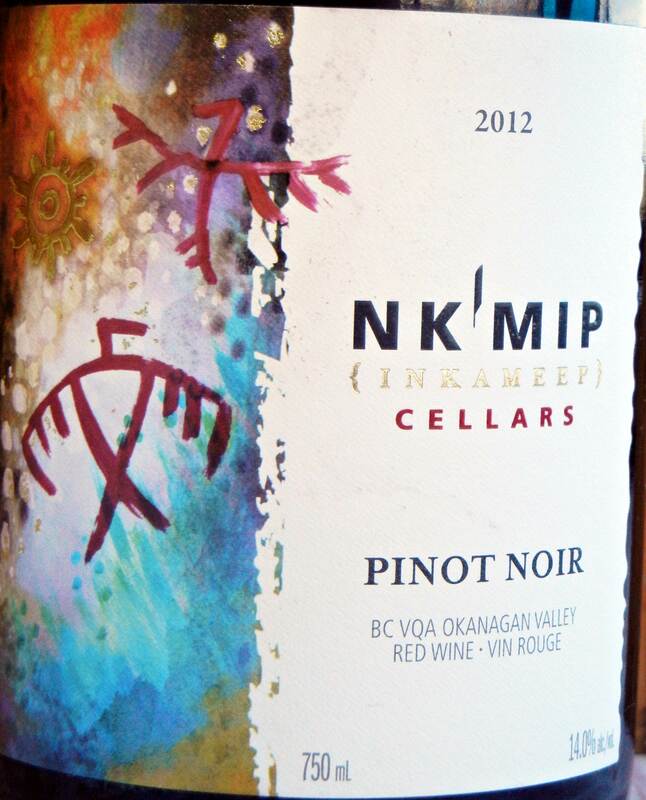 The grapes for their pinot noirs are sourced from throughout the Okanagan Valley. Gray Monk Estate Winery was acquired in 2017 by Andrew Peller Ltd. The winemaking duties for this vintage were shared by Roger Wong and George Heiss Jr.
Production is approximately 6000 cases. LC: Ruby to garnet. BG: Pale with ruby rim. AKG: Deep cherry. EU: Dark ruby. LC: Red berry, hints of forest, dry geranium. BG: Very aromatic cherry/vanilla, strawberry, floral. AKG: Warm earth, Mediterranean herbs, plum, burnt match. EU: Smoke, roast beef, barnyard/mushroom like Burgundy, dried red fruit. LC: Elegant. Delivers in the mouth what was on the nose. Well-balanced though a bit hot and sweet. Warm spices, white pepper, sweet red fruit. Burgundian. BG: Tar/cherry, medium intensity. Lingers a while. Great balance. Sweet spice, vanilla. Very long and the intensity maintains all away through the classy echoing finish. AKG: Rich peppery, big fruits, vanilla. EU: Cherry, vanilla, sour cherry on finish. High glycerol, distinct tannins with balanced acidity, light white pepper finish.